An earlier post explains the Laurentine Ice Sheet that completely covered what is now Canada also called the Wisconsinin Glacial Episode. The details of that post also apply to what is known as the ‘Ice Ages’. Glaciation repeatedly covered the far north and south during the period from 3687 to 687 BC, when Mars was captured and forced the lithosphere of the Earth to rotate with Mt. Kailas remaining in the ecliptic plane and a temporary north pole in central north America at 59 degrees latitude, perpendicular to the ecliptic plane. As a result, this area received no sunlight for one hundred 14.4-year periods interspersed with 15.6-year periods when the lithosphere returned to its present orientation. Modern-day studies of the global lithospheric motion have confirmed this. The limited extent of the glaciation is shown in Figure 1. All the known ancient cultures like the Vedic,, Egyptian, Greek, Sumerian, Mayan were not effected by this glaciation. In fact, the lack of seasons during the glaciation made the climates in these areas even warmer. The orientation of the Earth during each encounter with priori-Mars is confirmed in the Indo-Iranian Avesta which states that the presence of Angra Mainu (their name for Mars) made the world hotter. This publication makes clear that the Cyclic Catastrophism mechanisms, explained previously, were the source of their data. The 14.4-year periods of continuous cold, centered in central Canada, repeatedly formed huge glaciers 9,000 feet high. After each of these the lithosphere returned to its normal orientation for 15.6 years, and normal seasonal variations ensued, but ‘normal seasons’ meant that for half of each year winter conditions slowed the melting of the huge Canadian glaciers and sometimes added more snow. Thus the warm periods made up only 10 percent of the ‘Ice Ages’. But most of the data on the cold weather in the far north was collected by studying ice cores from Greenland – close to the Canadian glaciation and in the far south, Antarctica, which never warms under normal conditions. Fig. 2. 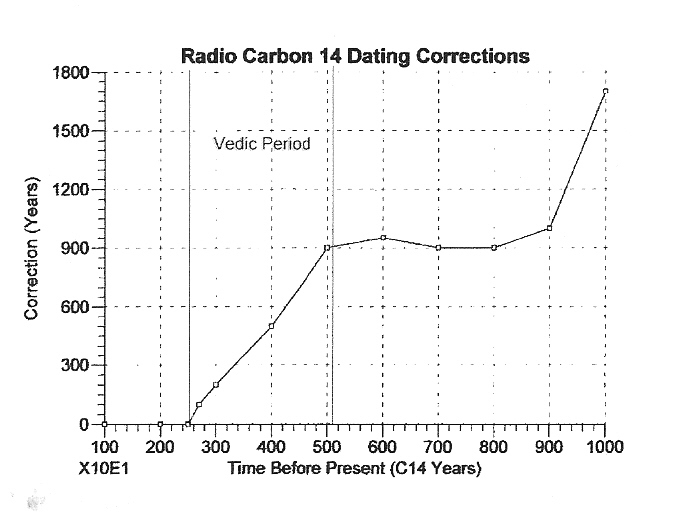 Tree-Ring Correction curve for 14C datng is evidence for a complete change of the Earth’s atmosphere during the Vedic Period. 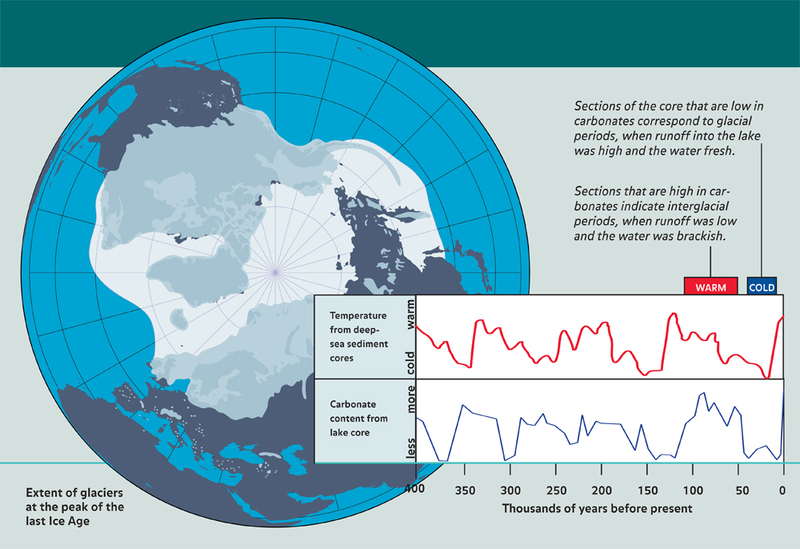 The air temperatures in the ice cores cannot be measured, instead they are inferred from ‘proxies’, ratios of oxygen and hydrogen isotopes. These are questionable sources because the atmosphere of the entire Earth was changed completely by the influx of Mars’ atmosphere during the same period (Fig. 2). Also some cores are interpreted with the belief they are resolving annual variations, but during the Mars’ encounters, the usual indications of ‘years’, layers of snow, were not being formed, so the ‘years’ measured in the ice cores during these periods were 14.4-years long. The volcanic eruptions from Mars and on Earth plus earthquakes caused by Mars were global and interpretations of these could not possibly be correctly interpreted from the ice cores. As discussed in many posts on this site, the dating from around the world is invariably based on U-Pb content of zircons, all of which were blasted from Mars during the geostationary encounters. Therefore the ‘two-million’ year Ice Ages in all the textbooks (text example above) are based on events which occurred between 3687 and 687 BC, while the rest of the world, warmed by the same captures of Mars, went about their business, as shown by the map in Fig. 1. They observed and propitiated Mars, stationary in the heavens, and Venus, but had little understanding of the changes it was making to the entire Earth, just as modern paleontologists today. ~ by Angiras on May 1, 2018.